Despite Ben Bernanke’s assurances that the nation is not headed into a recession, many people remain worried about their financial future. Wholesale prices of raw materials, including food and fuel, continue to rise, ultimately meaning higher prices for consumers down the road. The U.S. Department of Agriculture’s chief economist reports that food prices rose 4 percent last year and will rise another 3 to 4 percent this year. Smithfield Foods, the world’s largest pork producer, says its hog-raising costs have increased more than 20 percent in the past year, largely because of the high cost of feed. 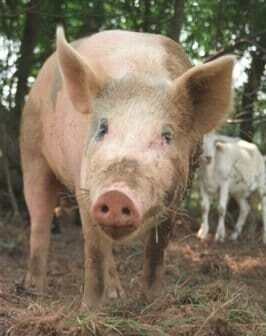 Meat-eaters can expect to foot the bill by paying higher pork prices. If you don’t want to spend your retirement fund on food, consider investing in a vegan diet. Some of the most versatile vegan foods-including beans, rice, vegetables, soy products and pasta-cost relatively little compared to animal products. According to a 2007 MSN MoneyCentral article, the cheapest cuts of beef, such as ground round, average $3 per pound; boneless chicken breasts cost $3.40 a pound; and canned tuna costs around $2 per pound. In comparison, dried beans and lentils cost less than $1 a pound, and rice is cheaper than $1 a pound. Tofu usually costs less than $2 per pound. Even vegans who buy costlier products like soy sausage and nondairy ice cream can still spend less than people who load up on beef, chicken and fish. Cows, chickens, pigs and other farmed animals are fed more than 70 percent of the grains grown in the U.S. But it is far more efficient and economical to eat grains and soybeans-and all the foods that can be made from them-directly rather than funneling them through farmed animals. A 2002 E Magazine article estimated that the amount of feed needed to produce just one 8-ounce steak would fill 45 to 50 bowls with cooked cereal grains. And if you regularly eat fatty, cholesterol-laden animal products, you may eventually land in the hospital, racking up enough medical bills to put you in the poorhouse. The Agency for Healthcare Research and Quality ranked America’s 10 most expensive medical conditions, and several of the diseases topping the list-heart conditions, cancer, high blood pressure and type 2 diabetes-are caused or aggravated by eating animal products. Those dollar-menu double-cheeseburgers won’t seem like such a good value when you’re paying through the nose for blood pressure pills or bypass surgery. If you factor in all the money you’ll save on hospital bills, medications and weight-loss plans by avoiding unhealthy, artery-clogging animal products, a vegan diet is downright economical. Health insurance companies in the United Kingdom and the Netherlands even offer discounted rates for vegetarians, and U.S. health insurance carriers are also starting to encourage clients to make lifestyle changes to reduce the risk of chronic diseases. “The connection between a vegetarian diet and reducing the costs of these high-impact health conditions is clear as a bell,” says Scott Forslund, the communications director for Premera Blue Cross. Plus, if you go vegan, you won’t need to feel guilty for not shelling out money for an environmentally correct hybrid car-researchers report that switching to a vegan diet is more effective in countering global warming than switching from a standard car to a Prius. Of course, the most important savings of all can’t be measured in dollars-each vegan saves more than 100 animals every year. So, if you want to save animals, your health, the environment and money, bank on a vegan diet.